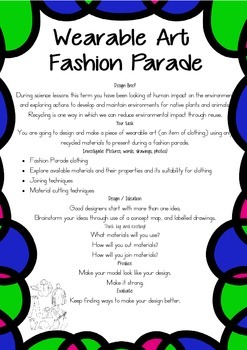 This is a design task for Technology where the children are asked to design and make a piece of wearable art (an item of clothing) using only recycled materials to present during a fashion parade. Good designers start with more than one idea. 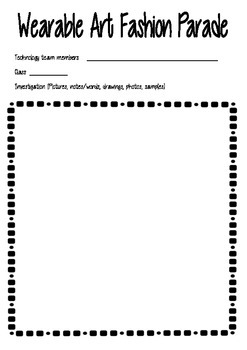 Brainstorm your ideas through use of a concept map, and labelled drawings. How will you cut materials? How will you join materials? Make your model look like your design. Make it strong. Keep finding ways to make your design better. 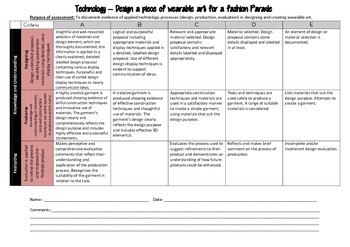 The file is to be made into a booklet and a martking matrix or rubric is included.